As Democrats and Republicans continue to clash in the Capitol, UChicago pols are bringing the battle home. 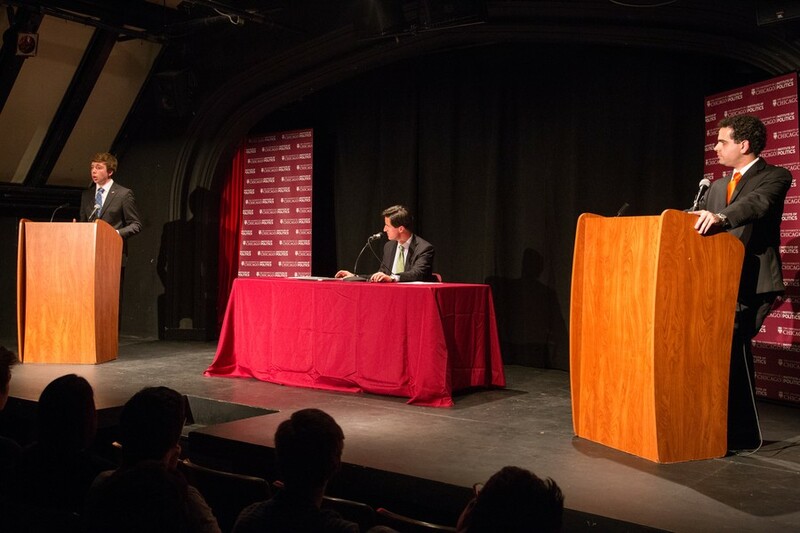 In the first major event of the new school year for both organizations, the UC Democrats squared off this past Wednesday against the College Republicans in a debate moderated by Institute of Politics (IOP) Deputy Director Steve Edwards. The two groups debated Obamacare, Syria, gun control, and entitlements, among other international, national, and local issues. The debate began with UC Democrats president fourth-year Benjamin Field and College Republicans president third-year Jonathan Godoy sparring over the Affordable Care Act. Field shared a story about his cancer-stricken girlfriend that moved many in the room, explaining how his girlfriend was fortunate enough to have health care and get treatment for her disease. “Having seen [my girlfriend] go through something like that, I know a little bit better how much health care means to people and I would like to give them the same quality care [that she received],” Field said. Godoy defended Republicans’ skepticism of the Affordable Care Act and centralized power in general. He spoke of a “new brand of conservatism, a reformed conservatism” which could encompass the youth by appealing to notions of hard work and the impartiality of the free market. According to Godoy, this new brand of conservatism attempts to unite the many factions of the Republican Party, which is currently splintered into a more traditional wing and a more libertarian wing. Third-year Anastasia Golovashkina of the Dems went head-to-head with GOP debater third-year Jeremy Sawyer over national issues, including taxes and entitlement reform. Sawyer received the biggest laugh of the night when describing the Democrats’ characterization of Republican entitlement reform. “Saying Republicans want to push Grandma over the cliff is not going to cut it in the 21st century,” Sawyer said, referring to a 2012 Democratic Super PAC ad in which a Paul Ryan look-alike pushed a senior citizen off of a cliff. Sawyer went on to say that Americans understand that for entitlement programs to continue to provide for those who depend on them, reforms, not scare tactics, need to take place. Beyond national headlines, the debate covered foreign affairs—Syria, Egypt, Iran, and China—as well as Chicago-specific issues like gun control. Editor’s Note: Anastasia Golovashkina is a Viewpoints columnist.